Enjoy Three Days Of Salmon Fishing On Three Different Rivers! Join us for a three day Salmon Fishing break in the Scottish Highlands and experience three different rivers near Fort William and Fort Augustus. We will go in search of wild Atlantic Salmon on the River Lochy, River Garry and River Oich which will give us a variety of fishing on three different and beautiful Highland rivers. 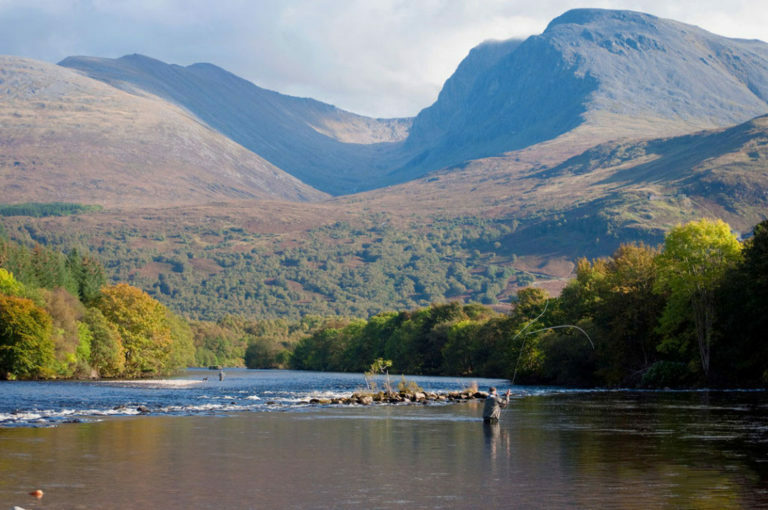 The River Lochy offers dramatic and scenic salmon fishing, with spectacular views of Ben Nevis (The highest mountain in the UK) as well as being known for it’s run of large Spring Salmon with an average of 15-17lbs and a history of bigger fish of up to 40lbs so there is a real chance of a fish of a lifetime! We will also head further up the Great Glen to the River Garry and River Oich also known for their large fish. Our first stop here will be at the River Garry where will fish the Estuary Beat where this hydro controlled river flows into Loch Oich which is a natural stopping point for fish. Depending on conditions we may spend the whole day in the River Garry prior to fishing the River Oich but we also have the flexibility of spending half a day on each river if affected by hydro water from the power station. This package is only available from May until the end of September due to the seasonality of these rivers. Three Days of fishing on th River Lochy, Garry and Oich.